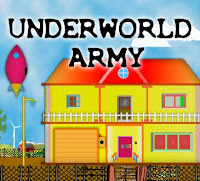 Underworld army is my first flash game which was sponsored by coolbuddy. -- Challenging logical puzzles. If you are a thinker, this game is for you. --Starts with very easy puzzles, but gets real harder in the middle of the game. --Quantity is big. It would take atleast an hour to finish the game. --Engaging story with a twisted ending. This game was featured in jayisgames link dump friday.